However, the Intergovernmental Authority on Development, an African trade bloc that brokered the peace process, issued a press release Tuesday in which it said Sudanese mediators, including President Omar Hassan al-Bashir, would continue facilitating the talks until a revitalized peace agreement for South Sudan was finally signed. “Most of us did not like to sign the agreement. That is a given fact. But ... we are waiting to start debate on the outstanding issues,” Bakosoro told VOA's South Sudan in Focus. 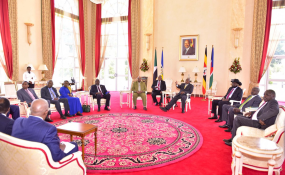 The South Sudan Opposition Alliance and the Former Detainees group have raised concerns about a provision in the deal that provides for the creation of an Independent Boundaries Commission to determine the number of states in South Sudan. Peter Mayen, head of the People's Liberal Party, part of a group referred to as the “other opposition parties,” said his group agreed to sign the deal with the same understanding. He said the success or failure of the agreement would depend on whether it was fully implemented.